A group of around 30 people protested on 6 January at the visit by Serb pilgrims to the church in the town of Gjakova/Djakovica, throwing eggs and ice when their bus arrived. The bus was not hit and safely entered the church yard. 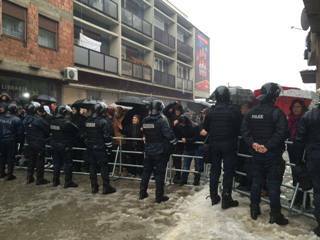 A Kosovo special police unit also put up a barricade which kept the protesters away from the church. The Gjakova/Djakovica police commander, Kriste Gjokaj said that the protest ended without further incident. “One protestor was arrested,” Gjokaj told BIRN. In January last year, large demonstrations erupted after a Kosovo Serb minister, Aleksandar Jablanovic, described protesters who demonstrated against the pilgrims’ last visit as “savages”. The protesters had thrown ice at the bus carrying the pilgrims, claiming that some of them had taken part in war crimes during the 1998-99 conflict in Kosovo. Jablanovic apologised but Kosovo’s Prime Minister Isa Mustafa eventually sacked him as Minister for Returnees in February 2015.